Any person who has been keeping track of the happenings in the Indian metal scene in the past year, will know about Bevar Sea. 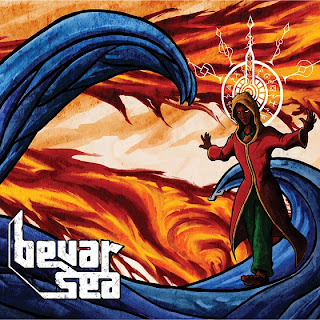 In case you didn't, Bevar Sea is a 5 piece Stoner Metal band hailing from Bangalore, India. They have been active in the scene for a couple of years now and their debut has been one of the most anticipated albums of 2012. I witnessed them first in some roughly shot video of Bangalore Open Air, where they shared stage with the likes of Kryptos, Suidakra and the mighty Kreator. Their performance there, sowed the seeds of interest in me. Their eponymous debut was released last year on Iron Fist Records, to much acclaim and praise. It is a four track long affair spanning roughly 45 minutes, and every minute is worth listening to. Their style of music is best described as 'old school' with the riffs reminding you Sabbath, Electric Wizard and the likes. I had heard all the tracks in the album before, from their various demos and live sessions, but yet i was eager to how they would sound on a record after receiving the studio treatment. I am not in the least bit disappointed with this record. The last song in the album however, Mono Gnome (a 17 minute saga about the sexual adventures of a lonely gnome), did take a little bit of time to grow on me. The vocalist delivers with a style of raspy vocals and it fits perfectly on a stoner album. The guitars are distorted and handled well, with the solos sounding trippy. The bass is not only audible , but it is laden with an infectious groove. These guys prove that a band can stick to the old school roots, without being technical, and yet write songs that are enjoyable. Lyrically, the songs deal with varied topics, just like the thoughts in a stoner's mind. For example, the song Abishtu, is about an undead biker who kills hipsters on the highway, while the song Universal Sleeper, is about a drug infused trip. The only complaint I have with this album is that it has only four songs. Though it spans the time of an average record (45 minutes), I was expecting more tracks to enjoy. A special mention has to be made about the artwork included in the digipak. All the artwork has been done by the band's lead guitarist Rahul Chacko. The artworks set the mood for each of the song which is pretty nice. Overall, it is a very good debut effort from this band. I just wish, the next time around, they will include more tracks for us to enjoy.